A little known fact is that, at the dawn and early growth of the U.S. cable television industry, most cable television operators earned zero profit. In fact, many showed consistent losses when measured in “net profit” terms. What some observers missed, however, is that despite their consistent losses on the bottom line, most players in that industry generated substantial cash flow, which they typically reinvested to grow their businesses – sometimes at astonishing rates. Today’s most street-smart entrepreneurs, like the cable TV pioneers who preceded them, know there are multiple ways to generate cash flow without generating profit. Why might they want to do so? For one thing, profits are subject to income tax. 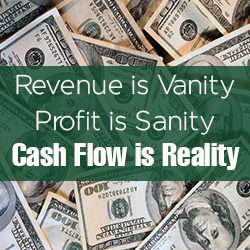 Cash flow (without profit) is not. For another, they know sooner or later, positive cash flow – not revenue, profit, nor ‘retained earnings’ either – is the lifeblood of every successful entrepreneurial venture. Cash allows them to make payroll at the end of the month. Cash enables them to keep their suppliers happy. And cash fuels business growth. Doesn’t just about every business person want to grow his or her business? If you are able to do so, like the cable TV pioneers, why worry about ‘profit’? “So how do they pull off this magic trick?” one might ask. Some small businesses, in asset-heavy industries like cable TV or real estate, do it by sheltering their income with substantial amounts of depreciation or amortization, thereby turning positive cash flow into negative – and therefore untaxed – profitability. They make substantial investments up front – buying or building an office or apartment building, for example – and then depreciate those investments over time. Nothing magic there, right? But it works. These days, though, growing numbers of entrepreneurs are doing it in an entirely different manner. They’re getting their customers to fund their businesses. By getting their hands on their customers’ cash – the revenues from what they’ve sold – before they have to pay their employees or suppliers, they are able to ‘live on the float’ and grow their businesses, without going hat-in-hand to their local banker or pandering to investors. There are five inventive approaches to customer funding that scrappy and innovative twenty-first century entrepreneurs are putting to use. “Could I do it in my small business or startup?” you may ask. In many cases, you can! Here’s how. Service-to-product models: Claus Moseholm and Jimmy Maymann of GoViral, a Danish company created in 2003 to harness the then-emerging power of the Internet to deliver advertisers’ video content in viral fashion, funded their company’s startup and growth with the proceeds of one successful viral video campaign after another. 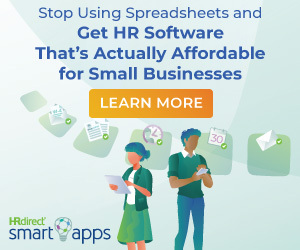 In 2011, after having turned their service business into a product platform that stood on its own, hosting and measuring the reach that the ads achieved. GoViral was sold for $97 million, having never taken a single krone or euro of investment capital. Pay-in-advance models: Bangalore’s Vinay Gupta built Via into the “Intel Inside” of the Indian travel industry. How? By asking India’s mom-and-pop travel agents for a rolling $5,000 deposit in advance in return for real-time ticketing capability and better commissions than the airlines were giving them. Do the math: 200 agents in his first few months in 2006 gave Gupta $1 million in cash to start and grow his business! By 2013 its revenue had soared to $500 million. Matchmaker models: By bringing together buyers and sellers, but not owning what is bought and sold, today’s matchmakers build great companies with virtually no startup capital. For Airbnb, the initial investment in 2007 was for a couple of air mattresses on the founders’ San Francisco apartment floor. By narrowly focusing on conventions that were too big for the city’s hotel inventory, Brian Chesky and Joe Gebbia built their business one step at a time – using the modest fees they took for bringing guests and renters together to cover their costs – until they got noticed at the Democratic National Convention in 2008. Venture capital funding eventually followed, and the rest is history: 800,000 properties in more than 190 countries! Subscription models: Krishnan Ganesh started TutorVista in 2005 with three Indian teachers and a VoIP internet connection reaching American teens who needed help with their homework. He quickly learned that $100 per month for “all you can eat” – paid monthly in advance – was just what the teens’ parents wanted. When renewal rates after the trial subscriptions quickly materialized at north of 50 percent, growing the business was simply a matter of adding more fuel. Ganesh sold the business in six short years for more than $200 million. Scarcity models: Jean-Jacques Granjon and his partners created the flash-sales phenomenon by doing something simple for Parisian designer apparel makers who needed to move unwanted inventory. By collecting payment from his online members who responded to limited 3-day sales and limited quantities of discounted items, and paying his vendors long after the goods had been ordered and shipped, Granjon didn’t need any capital to start or grow what became one of France’s hottest fashion brands. It’s easy to talk about your growing revenues – or your growing cadre of “users” – on the cocktail circuit, but by now I hope I’ve convinced you that revenue, without positive cash flow, is little more than vanity. Profit may bring you some sanity, but positive cash flow? It’s reality. And what is the most surefooted route to reality? Venture capital investor Mark Suster puts it simply – “I say ring the freaking cash register. I have said so for years!” Get your customer to ring your cash register using one of the five models, get good terms from your suppliers, and you’ll be well on your way! 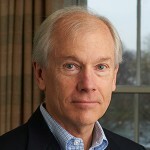 John Mullins is Associate Professor of Management Practice in Marketing and Entrepreneurship at London Business School. His latest book is The Customer-Funded Business: Start, Finance, or Grow Your Company with Your Customers’ Cash (Wiley, August 2014), from which this post has been adapted. John Mullins is an Associate Professor of Management Practice in Entrepreneurship and Marketing at the London Business School. He earned his MBA at the Stanford Graduate School of Business and his Ph.D. at the University of Minnesota. An award-winning teacher and scholar, John brings to his teaching and research 20 years of executive experience in high-growth retailing firms including two ventures he founded and one he took public. Since becoming a business school professor in 1992, John has published four books, numerous cases and more than 40 articles in a variety of outlets, including Harvard Business Review, the MIT Sloan Management Review, and The Wall Street Journal. His research has won national and international awards from the Marketing Science Institute, the American Marketing Association, and the Richard D. Irwin Foundation. He is a frequent speaker to audiences in entrepreneurship and venture capital. John's trade book, The New Business Road Test: What Entrepreneurs and Executives Should Do Before Writing a Business Plan (3e, London: Prentice-Hall/FT 2010), is the definitive work on the assessment and shaping of market opportunities. His newest book, the critically acclaimed Getting to Plan B: Breaking Through to a Better Business Model (Boston: Harvard Business Press 2009), co-authored with Randy Komisar, a partner at the esteemed venture capital firm Kleiner Perkins Caufield & Byers in California, was named to "Best Books of 2009" lists by BusinessWeek and INC Magazine. John has consulted with and done executive education on five continents for a variety of organizations both large and small, including Endeavor, Kenya Airways, Merck-Serono, Time Warner Communications, the European and African Venture Capital Associations, Pumpkin Ltd., the Young Presidents Organization, and the International Finance Corporation of The World Bank, among numerous others. He has served on the boards of fast-growing entrepreneurial companies in the United States, United Kingdom, Europe, and Asia. Awesome post! This is one of those things I’ve wondered about since I was a child working in my father’s business. He had a shop and there were always other shop owners making money but complaining about how much money they don’t have. When I started my business, those conversations were in the back of head the entire time. I made sure that I focused on profits primarily and it has made a huge difference. Great post!